Warranty Description: Life+Gear products have been designed based on the highest quality standards and are warranted against defects in material and workmanship for one year from the date of purchase. Damages caused by misuse, alteration or normal wear and tear are not covered under this warranty. Warranty is limited only to replacement of this product. 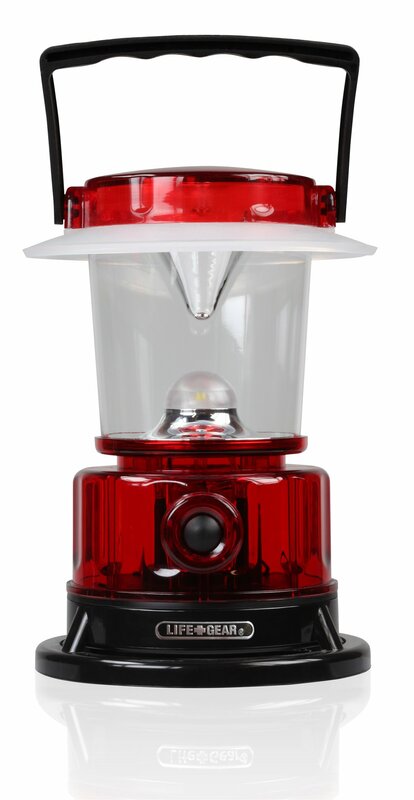 Color:Red The Life Gear 4 in 1 Glow LED Lantern 8 is a compact size LED lightthat includes four different light modes! (LED Lantern, Glow Red Nightlight &Emergency Red Flasher) Life Gears 8 Lantern is bright with 35 Lumens and theperfect size to take with you on any adventure. Hang in your tent as a handynightlight and bring along on hikes and attach to your backpack to light upareas with dim light. Perfect size for kids and for your bag when you need topack light! Life Gear is dedicated to developing and promoting innovativeeveryday products engineered with lifesaving capabilities. Life Gear want tohelp you be prepared for everyday life. To use, twist black base to get tobattery compartment. The Life Gear 8 Lantern takes 4xAA Batteries. Wheninserting the batteries, make sure the batteries are being inserted over thebattery compartment holder. The battery compartment is tight but is useful inhelping the batteries stay in place in case the lantern is dropped. Thelighting modes change with each click from LED Lantern, Red Glow & EmergencyFlasher. A convenient hook is located under the black base you can hang thelantern anywhere you need light.